Jungeun Lee is an art historian who specializes in medieval and early modern Japanese and Korean art and architecture. With her broad curatorial and research experience in the states and Korea, her primary research interests include formal interior display, visual and material ornamentation in architectural setting, court and shogunal patronage on arts and their collections, and the inter-cultural relationship among the arts of Japan, Korea and China. 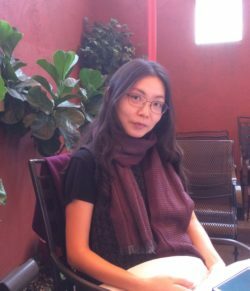 She obtained her PhD from University of Pittsburgh in 2017, where she investigated the socio-political and socio-economic contexts of the Ashikaga collection and the associated development, function, and multifaceted meanings of formal display in medieval Japan. Her dissertation explored the meaning of elaborate Ashikaga formal display as an ensemble and as a means of representing patrons’ identities in Kyoto’s complicated political and economic spheres. Part of this has been published as the “Politics of Formal Display” (Misulsa nondan, 2015) and her interdisciplinary approach toward formal display will be addressed in an international workshop, which will be organized at the Sainsbury Institute in summer 2018. In addition, she is working on a project on the inter-relationships between Japanese and Korean visual and painting practices by analyzing folding screens decorated with fans.